LOCATION: This home is a short walk to the beach and pool. entertaining family and friends. The chef in the party will enjoy preparing meals in the updated fully equipped kitchen. 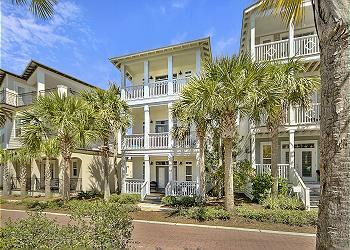 Hop on the bikes provided to explore Rosemary Beach or hit the beach and enjoy the beautiful Gulf of Mexico. Check availability and book this fabulous home today! 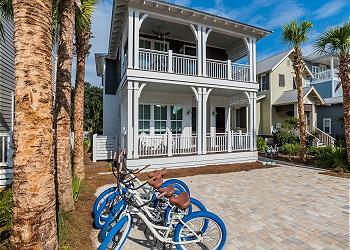 AMENITIES INCLUDE: 4 adult bikes provided, gulf view, porch on each bedroom. This property comes with 2 dedicated parking spots. Additional parking can be found throughout the community. Complete Clean Linen Participant - ALL linens, including comforters laundered upon every checkout. This is a beautiful beach home. Very clean, comfortable, and equipped with everything you need for a great vacay! Great location, close to the beach and within walking distance to great restaurants. Highly recommend. We had a wonderful time at this house. Everything was in perfect condition and we loved every second of our trip! Would definitely stay here again. We had a wonderful spring break at Mama K’s. We had 4 adults and 5 kids in our group. The location is perfect and the house was great. The beach was absolutely beautiful! We went to The Hub one night and had a blast. We did a bonfire on the beach another evening. We loved Amici’s in Inlet Beach, George’s in Alys Beach and Crabby Steve’s for lunch at the beach. Thank you for letting us enjoy your home for our time in Seacrest! We are so thrilled you and your beautiful family enjoyed "Mama K's" so much! The beach bonfires are always a blast as well! Thank you so much for choosing to stay with 360 Blue and be sure to come back and see us again soon! Perfect get-away weekend. The house is wonderful and has room for everyone. Short walk to beach and town for restaurants and shops. Really enjoyed biking around the area with the fun bikes provided. Thanks for a great beach getaway. We'll definitely be back to Mama K's! We are so glad that you enjoyed your vacation with us in Seacrest Beach! We agree that this home accommodates everyone perfectly and the location is hard to beat! Thank you for staying with 360 Blue, we look forward to seeing you again soon! What a wonderful home in a beautiful location. Beautifully decorated with everything you could need in kitchen. It is a short walk to the beach or the tram. The bikes are a wonderful amenity. Would definitely recommend this property. We are so delighted that you enjoyed your vacation with us in Seacrest Beach! We agree that this home is a great option for a fun and stress-free beach getaway! Thank you for staying with 360 Blue, we look forward to seeing you again soon! The house was gorgeous! Beautiful decorated and lots of room to spread out! So many decks to lounge on. I would highly recommend this home. What a fun photo! We are so happy to hear that you enjoyed your stay with us so thoroughly! The decks really are great to lounge on! Thank you so much for choosing 360 Blue for your beach getaway, and taking a moment to share your experience with us! Be sure to come visit us again soon! Mama K's is a fabulous place to stay. The beds are so comfortable. The house is very inviting with the soft blues and grays. There are plenty of TV's and plenty of sleeping accommodations. I liked being close to the restaurants on 30A and just a tram ride away to the beach. And don't even get me started on the bicycles. I'll be back next year Mama K's. What a precious photo! It's definitely one to look back on for years to come! We couldn't be happier to hear you enjoyed Mama K's so much! The location really is fantastic for exploring the community and beach! Thank you so much for choosing 360 Blue and taking a moment to share your valuable feedback with us. We hope to see you back at the beach again soon! It was our first trip to Seacrest Beach, and we loved everything about it. The house was very clean upon arrival. The garbage disposal had an issue one night after dinner, and someone was sent out that evening to get everything back up and running. I wish I could find such great service back at home! The house was in a great location, and served us perfectly. I would definitely stay here again and feel quite confident recommending this particular place for anyone's upcoming visit to Seacrest Beach. We are so elated that you had such a great time in this amazing home. We are so proud of our service team for the incredible service you received. Thank you for you kind words, we hope to see you back soon! We enjoyed MaMa Ks. The house was nice and the staff fixed a few initial problems. However, be aware of a recently passed ordinance banning tents on the beach. The beach access point from the neighborhood does not allow any wheeled apparatus...coolers, tents, etc. unless you use the tram. The tram was not a guarantee, on two occasions we got a recording that stated the tram was shut down due to inclement weather. It wasn't even raining. Thank you for staying with 360 Blue! We are happy you enjoyed your stay in Seacrest! We do apologize about the recently passed ordinance in Seacrest and due to it being an HOA issue, we unfortunately cannot do much to change it. Thank you again and we hope to have you back at the beach again soon! Our first time at Mama K's and loved it!!! The house was great! Great location to everything! Will definitely be back! What a beautiful family photo! Thank you so much for choosing to stay with 360 Blue! We are so happy you had such a wonderful vacation in Seacrest Beach! Be sure to come back and visit us again soon! Wonderful home with great space for three couples; four kids and one single adult. Loved the layout with 1st floor bedroom with king/bunk/bath for grandparents (so don't have to climb stairs); second floor master en suite and kids' bunk room that sleeps up to 8 kiddos, each with small porch; plus third floor master en suite with bonus futon, wet bar and porch hangout. Super close to two beach tram stops and two minute walk to pool. The only issue was the wifi and cellular reception was not great but since on vacation was no biggie! Need to unplug! I'd also allow guests to begin or just provide some basic spices in the kitchen (Italian seasoning, garlic powder, etc); that was helpful in other houses we've rented. Also some way to block the sun would help as by 6:00am it was a bit too bright with the transom windows. Would have been nice to know beach canopies are now prohibited. We didn't bring umbrellas so felt we were being forced to rent them. All in all a great stay. We'd rent Mama K's again! Such a great photo! Thank you for the valuable feedback. We are checking to see what window treatment options we have. Unfortunately, due to Walton County health code any perishable items (including spices) are not allowed to be left in rental homes. We are so happy to hear that you enjoyed your stay and we hope to have you back soon! Thank you for choosing 360 Blue and Mama K's! We loved having you with us and we are thrilled that you loved the home as much as we do. We hope to see you back at the beach soon! 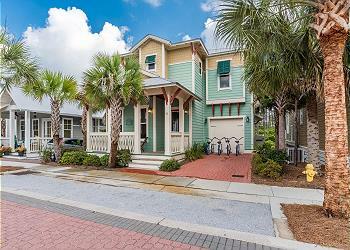 This is the perfect house in Seacrest beach! The location is phenomenal. Seacrest is a pretty large community and the location of this house sets it above the rest. Close to the pool and the beach it made our stay so much more pleasant because it was easy to get to everything. I would recommend bikes as that was a very fun part of the experience. The house itself is very well-appointed. There is enough dishware and flatware for a large group as well as all of the cooking tools you would need for almost any meal. Our family of six was staying with another family and there was plenty of room for everyone. The bedrooms are very large, each with their own outdoor access. We had our infant in the room with us and we were not crowded at all. 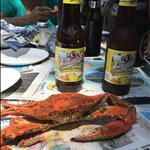 We hope to head back to Mama K\'s soon! We are so thrilled that you enjoyed your stay at Mama K's! This incredible home is the perfect place for a relaxing beach getaway. We loved having you with us and hope to see you back soon! Looks like it was the perfect day for fishing! We are so happy you had such a wonderful first time stay in Seacrest! We do apologize for the minor hiccup of the slow internet and rest assured we are working on remedying that problem. We are sorry to hear you did not find use of the golf cart and we are working hard on being more clear with our guest's about the refund policy as well. Thank you so much for staying with 360 Blue and we hope to have you back again soon! We are so happy that you and your beautiful family and friends had such a wonderful stay in Seacrest! Thank you for choosing to stay with 360 Blue! Thank you for your valuable feedback about the WiFi and we are working hard to address that issue in the future. Thank you again and be sure to visit us again soon! This was our first ever trip to the panhandle! I must say...amazing! The house we rented, Mama K's was simply awesome! We had 15 people total, 8 of them teens and adults. The house was super clean, spacious and very well equipped! The kitchen equipment was excellent and well appointed! (I couldn't find cookie sheets to make French fries ?lol) All the bedrooms made nice private retreats that people would go to and regroup. Everything was perfect. We were a short walk to beach. We rented a stroller from the 360 link and it worked very well. Over awesome house that we would defiantly return to! We are so happy that you had such a wonderful stay in this amazing home! We are so glad that you took advantage of our concierge service, it makes everything so convenient! We hope to see you all back soon (we will be sure to have cookie sheets!)! We really enjoyed our stay! The house was clean and beautiful! And only a short walk to a stunning beach! Having 3 kids, I really appreciated how roomy the house was. It had tons of storage space and several bunk beds! I would love to stay there again, it was a wonderful, peaceful beach retreat! We are so thrilled that you had such a wonderful stay in this beautiful home. We enjoyed having you with us and hope to see you back soon! We have been coming to 30A for 8 years and have always stayed in Seacrest for it's great location to the beach, shopping and restaurants. The property also has a very nice pool for adults and children alike. This is one of the nicer houses we have stayed in. We have two teenager daughters and they each brought a friend so more than enough room for everyone to have their own space. The décor is very relaxing, beachy and the home overall is in great condition. The cleaning service did an excellent job preparing the home for our visit. Agree with other comments the kitchen is very well equipt. 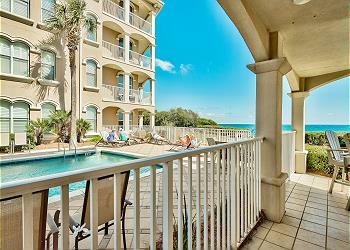 The location in Seacrest is very convenient to the pool and a quick walk to the beach. Happy the rental came with 4 bikes so we didn't have the extra expense to rent them. I would recommend this home and would stay here again. Your 360 Blue app/website are a bonus vs. going through VRBO - great service! Thank you so much for choosing 360 Blue! We are so happy that you were able to enjoy all of the amazing things that this home and community have to offer. We loved having you with us and hope to see you back at the beach soon! Just leaving 56 Sand Flea on the morning of July 30. We had a great time in this beautiful house! We were a group of 12 -- grandparents , 6 grands ( ages 5-13), and their parents. Each couple not only had their own bedroom but also their own floor! The grands loved the bunk room and the 13 year old granddaughter used the futon area off her parents room on 3rd floor as her own private space! Nana and granddaddy Bob used the bedroom downstairs because we are early risers and enjoy being close to the coffee pot. Occasionally a young grandchild would find their way down to sleep in a bunk in our room which we loved! Nana enjoyed cooking a breakfast buffet with everyone's favorites each morning. Thank you for a VERY WELL STOCKED KITCHEN!!! We would eat breakfast, load the dishwasher, and still have plenty of silverware and dishes if needed for the rest of the day. We are so happy to hear that you had such a great time in this home. Sorry to hear about the construction waking you up early, we hope they will be wrapping that up soon. Grocery delivery is beyond convenient, worth every penny to skip those grocery store lines. We appreciate you choosing 360 Blue and we hope to have you back soon! This is our 3rd time to Seacrest and first stay at 56 Sand Flea. This was one of the nicer homes that we have stayed in with lots of room and was very clean. A few down falls are: the patio area out back is a bit small if you enjoy sitting out in the evenings. There is currently a new home being built next door so there were lots of construction workers up and at it around 7:15 each morning....no sleeping in on vacation. We also experienced a water value burst outside and we were without water for about 8 hours on our first full day. Despite all that we would still recommend this home and we would stay here again. Location is great up near the front of the neighborhood making it a quick walk to the beach or pool. What a great view! We are so sorry that you had some hiccups during your stay but happy to hear that you still enjoyed this great house. We look forward to having you back soon! Great beach vacation! Seacrest is such a fun area, and this lovely house made it perfect. We found it to be fresh, clean, spacious, and inviting. The furnishings are all obviously newly updated. The layout is very kid friendly with huge bedrooms and plenty of storage space. We loved all the hooks in every room. So easy! The house's location at the front of the neighborhood was super convenient to the beach, restaurants, and shopping. If you have tons of stuff to haul to the beach, definitely try the shuttle. They arrived within 5 minutes of our call and were very friendly and helpful. We also really enjoyed the beautiful pool area which is literally a two minute walk from the house. The bikes that are provided are in good shape and made our evening explorations of Rosemary and Alys beaches lots of fun. We loved the fish tacos at Cowgirl Kitchen, and ice cream cones at The Sugar Shack in downtown Rosemary Beach. Everything about this trip exceeded our expectations. We will definitely be back! Sounds like an amazing stay! We are so happy to hear that you love this home as much as we do, truly a perfect location. Thank you so much for choosing 360 Blue. We hope to have you back again soon! Great time at a great home! Having rented many vacation homes, this one is well-equipped for multiple families and lots of kids. We enjoyed the views, outdoor space, bikes and comfortable beds. As important as the beautiful home is the location in the neighborhood…it is only a 3 min walk from the amazing pool and the crosswalk to the beach….much closer than most houses in Seacrest. We can’t wait to bring more friends with us next year. Thank you so much for choosing 360 Blue! We are thrilled you enjoyed the house so much! We can't wait to have you back at the beach again soon! Our stay was amazing. We were celebrating my birthday and our 32 wedding anniversary. The house was cozy and very well equipped. I felt like I was at home. And it was difficult to leave. We are making plans to return at the end of the summer or early fall. The bikes are a great addition and easy to access and use. The beach is a very short walk or using the tram. We preferred to walk it gave us time to chat and look at the other homes. Georges is a must!! The best salmon I've ever had, and the service was great and in walking distance Stefanie was a great help at 360...she laughed with me and gave great advice on where to go. Would I Go back? YES! YES! We are absolutely thrilled to hear you had such a great time in Seacrest Beach! This home is in such a great location for exploring by bike and foot! We look forward to having you back! Thank you for choosing 360 Blue!